The conservationist agricultural practices developed by George Washington Carver at the beginning of the twentieth century increased agricultural sustainability for poor African-American farmers in the U.S. Deep South. An expert in revitalizing soil, Carver worked through the Tuskegee Institute in Alabama to publicize composting techniques and the importance of crop rotation , which helped combat soil depletion and pest infestation in the region's overcultivated cotton and tobacco fields. Carver was born into slavery in Diamond Grove, Missouri, sometime between 1860 and 1864. His parents were lost to Confederate slave raiders. Formal education of blacks was not widespread, and only through his own tenacity did Carver become Iowa State's first African-American college graduate, earning a bachelor of science degree in 1894 and a master of science degree in 1896.
month during its first summer, and served as a model for the U.S. Department of Agriculture's extension program. One of his forty-four instructional manuals, How to Grow the Peanut and 105 Ways of Preparing It for Human Consumption, published in 1916, revealed new uses for peanuts and their byproducts, including paper, paints, insecticides, shaving cream, peanut butter, and bar candy. An American peanut industry developed as a result, and Carver became its chief spokesman. In 1921 he addressed Congress to urge high import duties on peanuts grown in Asia. After this successful presentation, Carver's fame spread and he became the first African-American scientist to achieve national acclaim. Carver died at Tuskegee on January 5, 1943, but continues to receive posthumous awards. His childhood home is a national monument, and in 1990, he was inducted into the Inventors Hall of Fame. SEE ALSO A GRICULTURE . Holt, Rackham. (1943). George Washington Carver: An American Biography. Garden City, NY: Doubleday, Doran and Company. Kremer, Gary, ed. (1987). George Washington Carver in His Own Words. Columbia, MS: University of Missouri Press. McMurry, Linda. (1981). 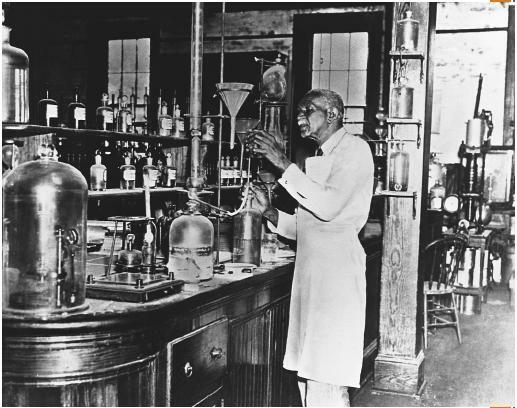 George Washington Carver, Scientist and Symbol. New York: Oxford University Press. "Facts of Science: African Americans in the Sciences." Princeton University Web site. Available from http://www.princeton.edu/~mcbrown .